Summer is in full swing and it's also peach season here in North Texas! I haven't had the chance to visit our local peach orchard this year, but we're planning a trip really soon. Until then today's deliciously easy recipe for these Peach Pie Cinnamon Rolls uses a simple can of peach pie filling with the addition of cinnamon, brown sugar and vanilla. I'm all for taking shortcuts when it comes to summer baking and this recipe is as easy as pie, peach pie to be exact. If you love peaches, I can guarantee that you'll love these peach pie style sweet rolls topped with a simple vanilla-cream cheese icing. 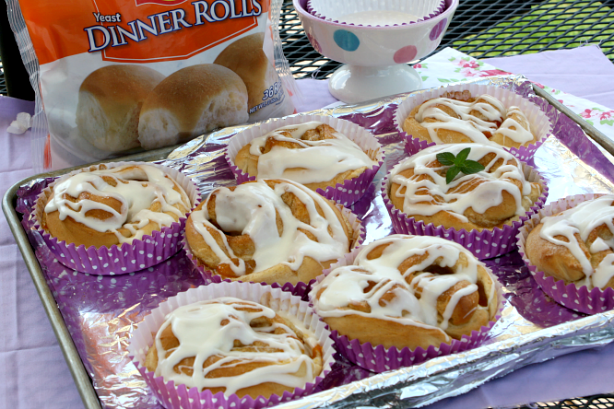 These ooey-gooey sweet rolls are simple to make and start with Rhodes frozen dough. If you've never baked with frozen bread or roll dough before, you should be. Rhodes frozen dough is a convenient way to enjoy the taste of homemade bread anytime. I love Rhodes because it tastes just as good and bakes up soft and fluffy like homemade bread dough. 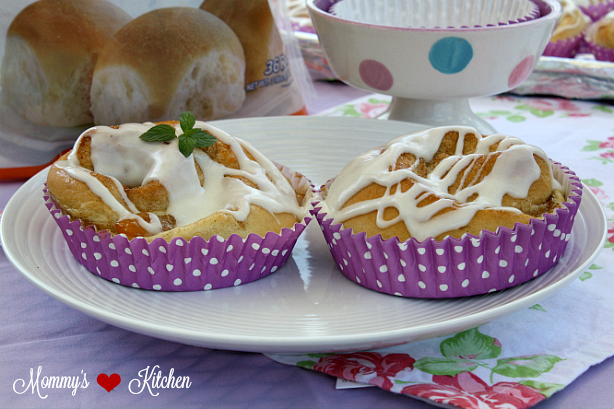 I baked up these single serving peach rolls in these cute over sized baking cups, making them perfect for breakfast, brunch or dessert. 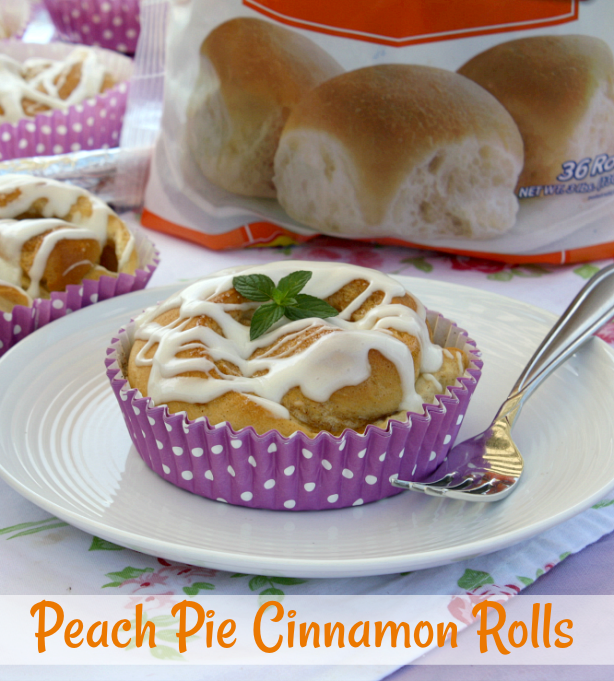 Everyone loved these simple sweet rolls and they taste just like peach pie! I will definitely be making these again. If you're more of an apple pie lover, try my recipe for these Apple Pie Cinnamon Rolls. 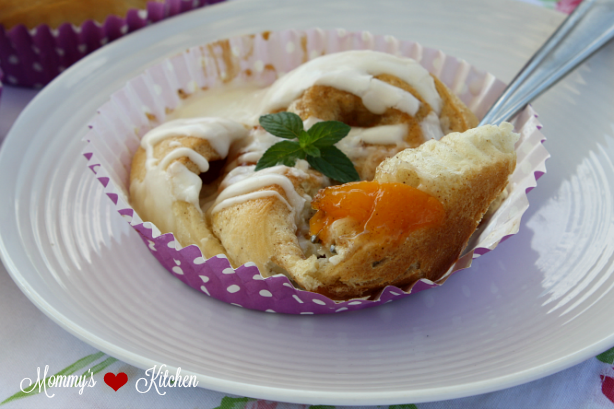 If you would like to get the recipe for these delicious Peach Pie - Cinnamon Rolls, Stop by the Rhodes Baking Blog, where I'm guest posting and sharing the complete recipe and step-step instructions. Thaw one loaf of Rhodes bread dough or 15 dinner rolls, until soft, but still cold. Lightly spray the counter top with non-stick baking spray or dust with flour. Using a rolling pin, roll the bread dough into a 9 x 12 –inch rectangle or as close as you can roll it out to that size. If using dinner rolls, combine the rolls into one dough ball and then roll out dough into a rectangle. If you have difficulty rolling out the dough, let the dough rest a couple minutes in between rolling. In a small bowl, combine the peach pie filling, 1/2 cup brown sugar, cinnamon and vanilla extract. Lightly mix to combine. Spoon and spread the pie filling mixture over the dough to within 1-inch of the dough edge. Sprinkle the remaining brown sugar over the filling. Starting from the long side roll up the dough tightly and seal the ends. Using a sharp knife or dental floss, cut into 8 -10 equal pieces. Place each roll cut side up into each large baking cup liner that has been sprayed with non-stick spray. Place all the filled baking liner cups on a large baking tray. Spray a piece of plastic wrap with non stick spray and place over rolls. Let the rolls rise until double in size (about 45 minutes to 1 hour). Remove the plastic wrap and bake in a preheated 350 F degree oven for 20 - 25 minutes or until the rolls are golden brown. I use the convection feature on my oven for the last 5 -7 minutes to brown the rolls evenly on the top and bottom. Remove from the oven and let rolls slightly cool on a baking rack. Combine the glaze ingredients and drizzle over warm peach rolls. Okay, I seriously want to reach through the screen and grab one of these to go with a cup of coffee. I love peach anything!! Thanks for sharing. I am all about eating anything that's single-serving side. Especially when it comes to sweets because I can really get carried away. These would also be super cute to sell at a bake sale! Oh yum! What a creative summertime breakfast recipe. Peach pie cinnamon rolls sound amazing to me. I love peach everything in the summer so I need to try these. thanks for the fun idea. GOOD Lord!! Can you make me a few lol, wow this is one amazing peach pie recipe and you have my mouth watering. My hubby loves pie - all kinds of pie so I definitely need to try this! I never thought to use rolls to make pie! The peaches make it the perfect Summer dessert! I have a gluten allergy and have never really been a fan of cinnamon rolls, but this recipe...this sounds so delicious and one that I would love (if it were gluten free). I love peaches and I think the peaches in the cinnamon rolls would make them so much better! OMG these peach pie cinnamon rolls look amazing. I can already imagine how delicious they taste. The vanilla cream cheese icing on top makes the presentation look more appealing. Pie AND cinnamon rolls? Sign me up! This looks absolutely delicious. Of course I would have to try to find some vegan friendly ingredients, but I cannot wait to make this recipe! OMG I love this recipe. I'm a peach cobbler lover and anything peach, so I NEED to try this. These look SO good, and I love that they're nice and simple to make. These are my favorite recipes because we get so much last minute company, I don't always have time to do everything from scratch (and I'd much rather be enjoying my company than spending my time in the kitchen!). I have got to know more about these rolls, because frozen bread sounds like an amazing idea!